Miss Kate Cuttables DT Day - Oh, The Places You'll Go! Before I share my project I just want to remind you to go and grab your Freebie of the Day! 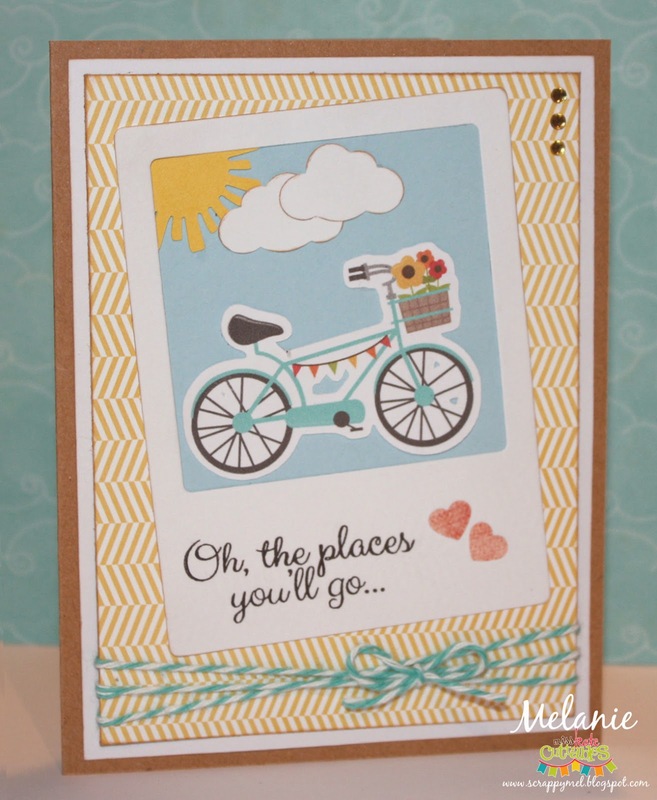 For this card I used a new toy - the Papertrey Ink Fabulous Frames Die. I use the piece that looks like a polaroid photo. I made my own "Print and Cut" of Miss Kate Cuttables Bicycle file using the shadow layer on MTC and my printer. I really need to by the Designer Edition for my Silhouette so that I can use SVG files but for the time being this is the only way I can make a "Print and Cut". I also cut the sun from MKC Happy Sun and Clouds file and a couple of mini clouds with my Fiskars cloud punch. I added two small paper hearts, baker's twine, 3 tiny gems and a sentiment from Scrappy Moms Stamps Ready, Set, Go! stamp set to finish my card. I hope you like my card as much as I do. Have a great day! Labels: Cards, Miss Kate Cuttables, Ready Set Go! Hello, everyone! I hope your week is going well - it's been a strange one here! We have had record high temps here in AZ. Most of the country is freezing and we had to break out the shorts! But don't be jealous - think what that means for summer - yikes!!! Thank you so much for joining me today for my Terrific Tuesday Challenge project! 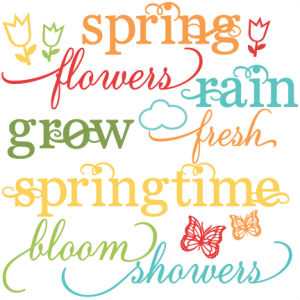 Come join us and link up you project that spotlights "Things That Go!" 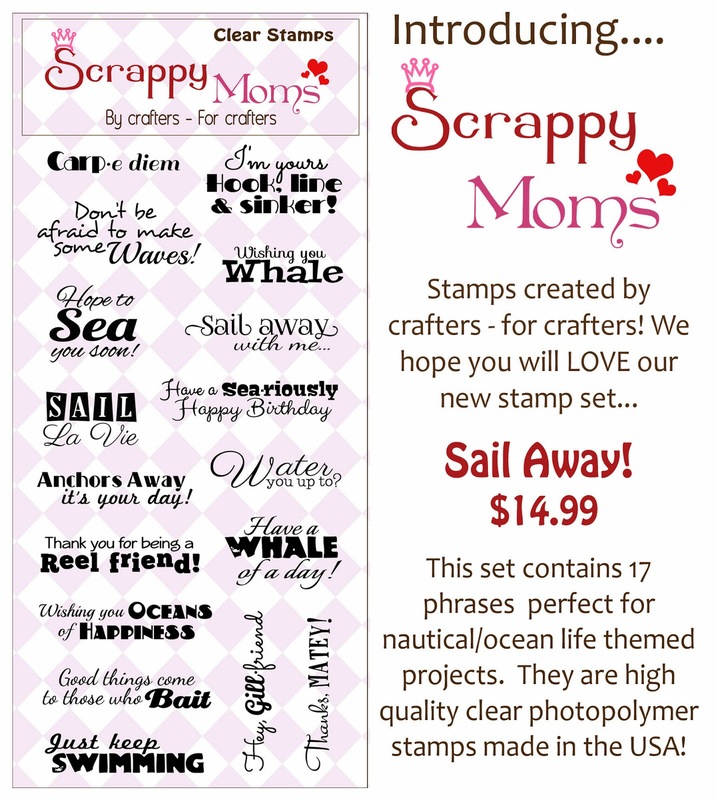 for a chance to win a Scrappy Moms Stamps set of your choice! 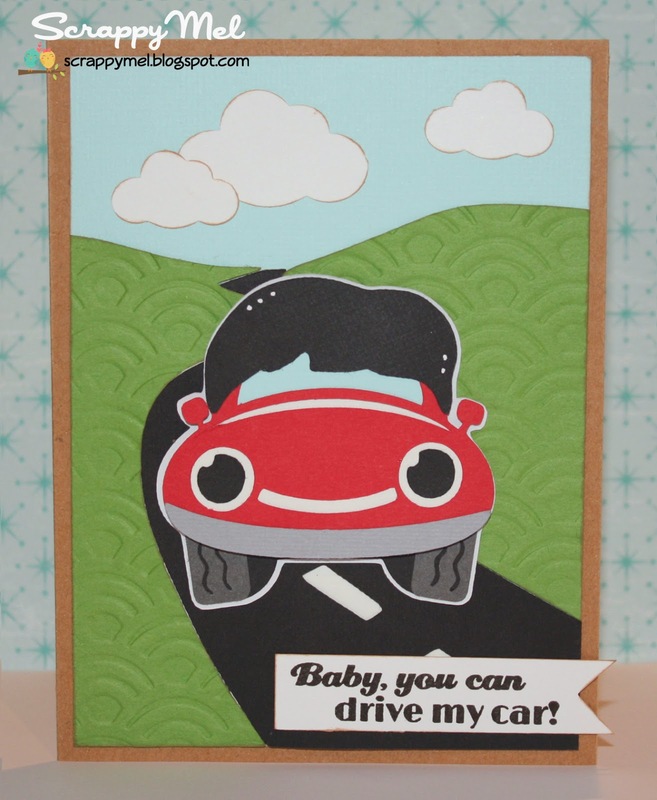 Scrappy Moms Stamps Sneak Peek #2 - Baby You Can Drive My Car! I have always LOVED the Beatles - my brother was a fan and shared his love of them with me when I was little. In fact, one of the very 1st songs I ever remember hearing is "Yellow Submarine". So when we made this set I knew I wanted to use this with some kind of Beatles theme. When I saw this little Miss Kate Cuttables Beetle Bug SVG file I immediately thought about putting a Mop Top wig on him. LOL I created the back ground and wig SVGs from images on the web and Ta-Da! Thank you so much for stopping by to see my project for the day. 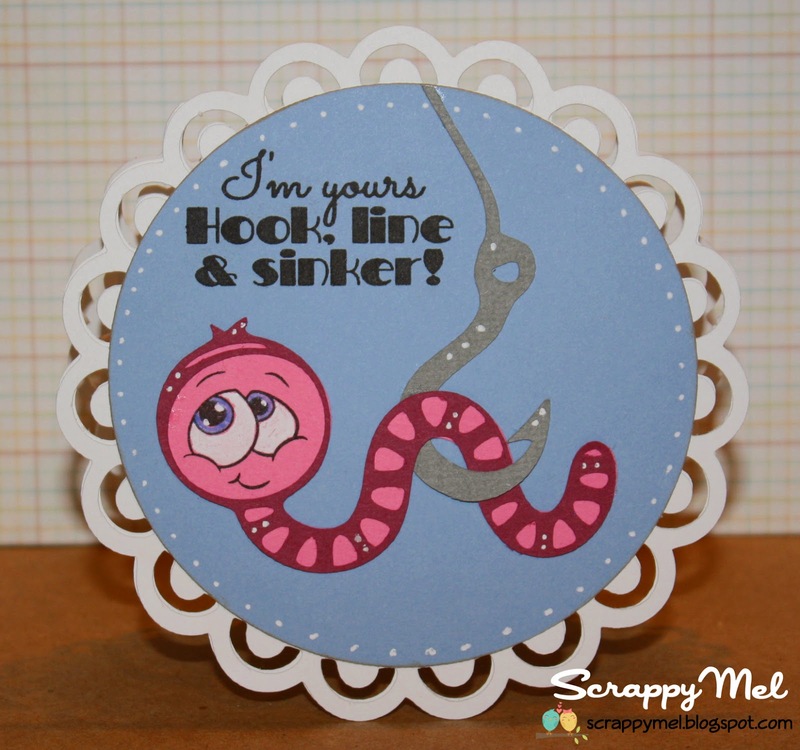 All of our DT will have projects from the February Scrappy Moms Stamps release this week, including this month's Guest Designer - Roberta from Adventures of a Bedtime Crafter! 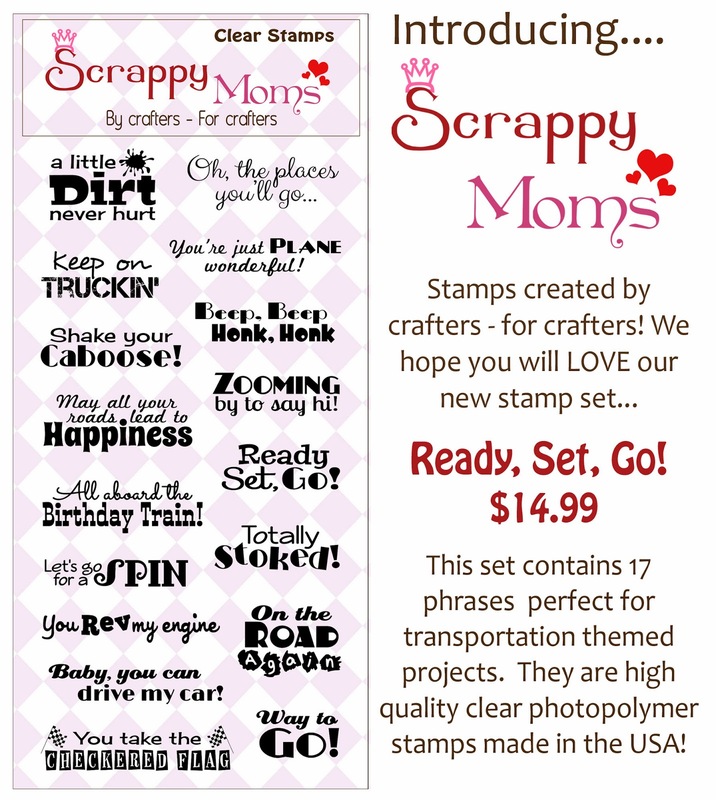 Introducing New Scrappy Moms Stamps - Ready, Set, Go! 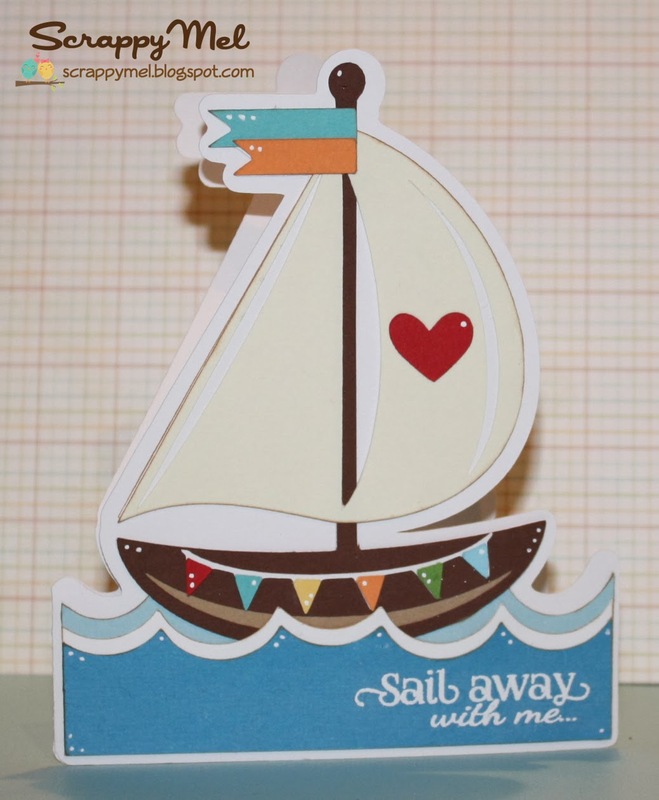 and Sail Away! Here is the 2nd set we are releasing this month - Ready, Set, Go! I hope you liked my card and that you will visit me again this week for new projects. 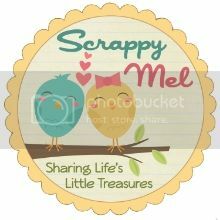 In fact, all of our Scrappy Moms Stamps Design Team, including our February Guest Designer - Roberta from Adventures of a Bedtime Scrapper, will have new project all week. We used bubble gum and a regular balloon. :) Since I had to make so many of them I decided to use the .jpg version of MKC Heart Balloons in Clouds file and Photoshop to print the them on the topper. 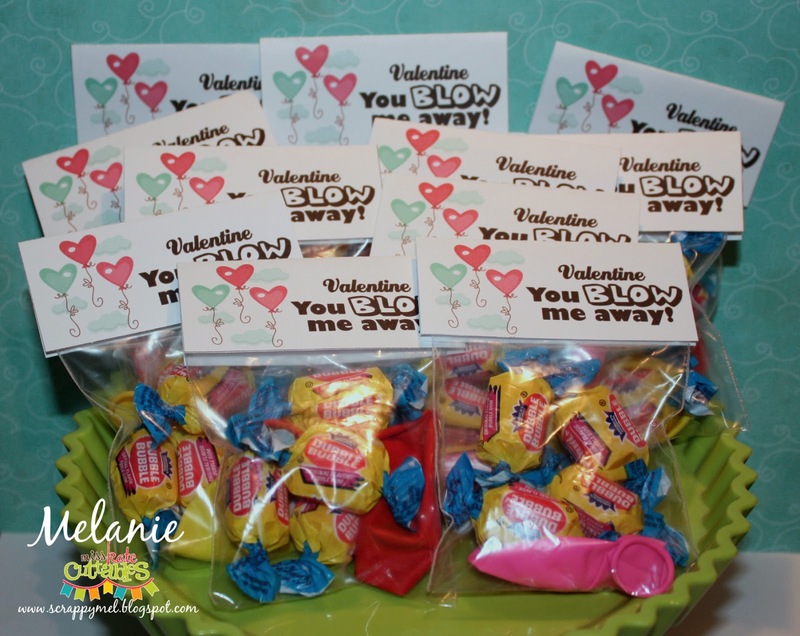 Then I combined 2 Scrappy Moms Stamps sentiments ("Valentine" from Crazy for You (I masked off the rest of the stamp) and "You Blow me away" from Candy Grams). This was soooo fast and easy for making mass-production projects. This is only a handful of the treat bags - there are about 40 more, LOL! 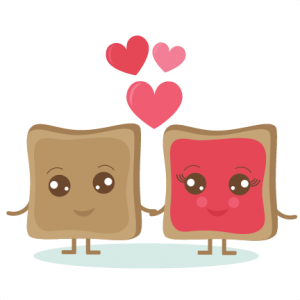 Terrific Tuesday Challenge - Love is in the Air!